14ymedio, Havana, 24 December 2015 — About to turn 40, Zaqueo Baez was completely unknown until 20 September 2015, when he mocked the seven security cordons protecting Pope Francis minutes before his first Mass in Havana’s Plaza of the Revolution. Clinging to the railing of the Popemobile, Baez, managed to deliver a letter to the pontiff and loudly denounce the “new evil” that violates human rights in Cuba. 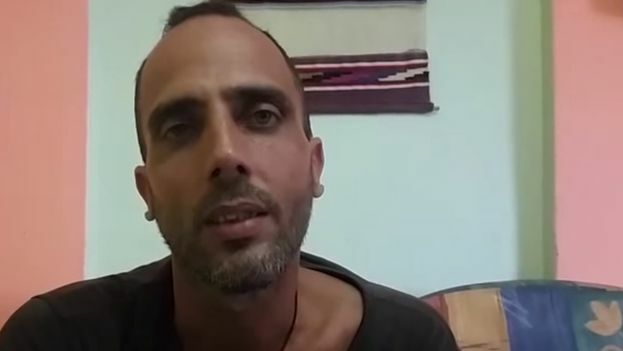 Baez, a member of the Patriotic Union of Cuba (UNPACU), was immediately arrested along with three other activists. After a several day hunger strike he was released, but not before being accused of public disorder, disrespect and resistance. Today he is in legal limbo, having no single document clarifying his situation. His bold action had admirers and detractors. Some described him as heroic, others as disrespectful, but the event was recorded in a video that showed it to the world. After his release, the activist has been arrested on each of the multiple occasions in which he has participated in a protest. Nevertheless, he wants to stay in Cuba to continue fighting for his ideals.